Egyptian army tanks move along the Corniche Al Nile near the Information Ministry. Read full coverage of the unrest in Egypt updated continually by CNN reporters worldwide. Are you there? Send your photos and video to iReport. Thousands of demonstrators took to the streets of Egypt's major cities on Friday, Saturday and Sunday, demanding an end to President Hosni Mubarak's 30-year-rule. Here are the latest developments as confirmed by CNN. [Update 3 p.m. Cairo, 8 a.m. ET] Turkey has sent two planes to Egypt to begin evacuating its citizens. [Update 2:45 p.m. Cairo, 7:45 a.m. ET] State-run Nile TV reports that Egyptian President Hosni Mubarak is currently visiting an armed services operations center to follow up on the security situation and in show of support. 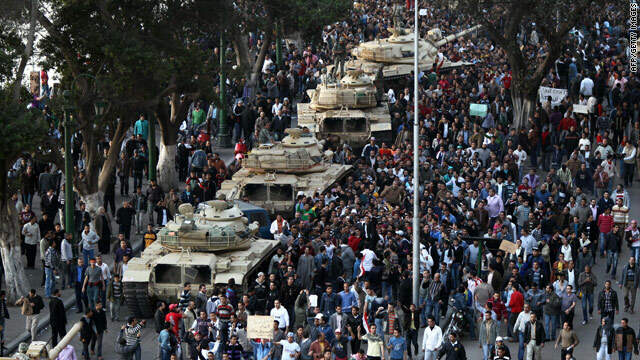 State television also reporting that Egypt's military has arrested 450 people in various parts of Cairo. Egypt's defense minister, Gen. Mohamad Tantawi, urged the public Sunday to obey the 4 p.m.-8 a.m. curfew (9 a.m.-1 a.m. ET) Tantawi's statement was carried by state television, and Tantawi was escorted to the network's headquarters by red-helmeted troops in a convoy of sport-utility vehcies. Tantawi is among the Cabinet ministers that Mubarak announced he was replacing over the weekend. Also Sunday afternoon in Cairo, Al Jazeera "strongly denounces" the closure of its Cairo bureau by the Egyptian government, the news network said in a statement Sunday. Egypt's information ministry announced the shutdown of Al Jazeera in Egypt and the withdrawal of its media license to operate in the country, state-run Nile TV reported Sunday. [Update 1:50 a.m. Cairo, 6:50 p.m. ET] - Roughly 1,000 prisoners have escaped from Prison Demu in Fayoum, southwest of Cairo, state-run Nile TV reported early Sunday. The inmates are "on the streets causing chaos and families are scared," according to Nile TV. [Update 1:33 a.m. Cairo, 6:33 p.m. ET] - Seventeen people have been shot to death by Egyptian police, according to Reuters. Twelve people were killed trying to attack a police station in Beni Suef governorate, south of Cairo, Reuters reported. Another five people died in an attempted attack on a station in Nasr City, according to Reuters. [Update 1:16 a.m. Cairo, 6:16 p.m. ET] - CNN's Ben Wedeman (#bencnn) tweeted that angry crowds dragged two looters to soldiers. The army is in control of the Egyptian Museum. The Egyptian Museum hosts one of the most extensive collections of Egyptian artifacts in the world, including the treasures of Tutankhamun. In addition to jewelry, sculptures and artwork, the museum boasts the Royal Mummy Room, which features the remains of several pharaohs. The artifacts were discovered around the turn of the 20th century. In Alexandria, CNN's Nic Robertson (#NicRobertsonCNN) tweeted that gangs of machete- and iron-bar-wielding youths are stalking the deserted streets of Alexandria despite a curfew. [Update 12:53 a.m. Cairo, 5:53 p.m. ET] - In front of military tanks, people have gathered arm in arm outside the Egyptian Museum, protecting the famed building from looters. Neighborhood protection groups wearing white armbands in Cairo. People getting organised to end chaos and looting. NDP source says Omar Sulaiman VP appointment should be seen as first step for transfer of power. [Update 9:40 p.m. Cairo, 2:40 p.m. ET] - National Security Adviser Tom Donilon on Saturday held a meeting with top officials to discuss the events in Egypt, White House spokesman Tommy Vietor said. Among the participants were Vice President Joe Biden, Secretary of State Hillary Clinton and Adm. Michael Mullen, chairman of the Joint Chiefs of Staff. Israeli politician Benjamin Ben Eliezer says Egyptian President Hosni Mubarak recently told him "this is not Beirut and not Tunis." In an interview with Israeli TV on Saturday, Eliezer said that Mubarak suggested that Egyptian authorities knew what was going on and had prepared the army in advance. In Alexandria, the scene at hospitals was chaotic, CNN's Nic Robertson said in a message on Twitter. The facilities were short-staffed and injured protesters said they were not being treated quickly enough. [Update 8:19 p.m. Cairo, 1:19 p.m. ET] Cairo residents have given accounts of lawlessness after police withdraw from the streets. There were reports of looting and residents appealing to authorities for protection. CNN photojournalist Mary Rogers saw businesses looted in a downtown Cairo mall. She saw fast-food restaurants - KFC and Hardee's - smashed and looted. People were carrying items from the mall. Journalist Ian Lee said vigilante groups in a middle-class Cairo neighborhood called Dohy were forming to protect personal property. He heard live fire, but saw no police presence. Soldiers were in the area but did not respond to the trouble, he said. CNN's Fred Pleitgen tweeted: Illegal checkpoints popping up in Cairo. Just ran by a group of guys with guns and clubs. From Alexandria, CNN's Nic Robertson tweeted: Without police, Alexandria residents fearful of looting, set up neighborhood watch, board shop windows. Came to office by Cairo metro today. People talking about Mubarak as president IN THE PAST TENSE. For most I spoke, Mubarak is gone. Almost all police stations ransacked, arsenals looted. Suddenly weapons in the streets wielded by thugs. Where is the army? Saw a truckload of riot police leaving Cairo this morning. they looked defeated and scared. people say "they should be"
In residential areas of Cairo people setting up barricades to protect their streets. Wielding clubs, knives fearing looters. Man in Tahrir Square told me "We have fired Mubarak." It's clear from the streets that he's no longer wanted. As violence in the streets continued in Egypt, U.S. President Barack Obama convened a meeting of his national security team on Saturday, the White House said in a statement. 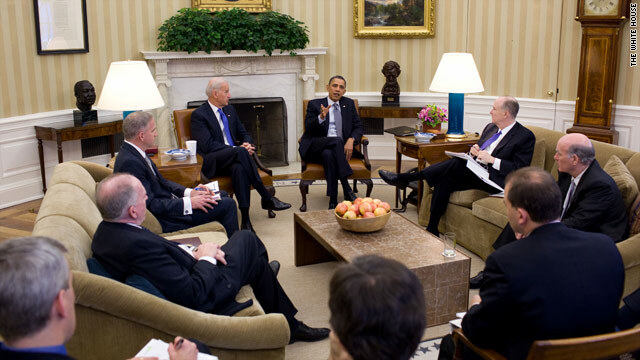 During the meeting, which lasted just more than an hour, Obama was updated on the situation in North Africa. He restated the U.S. focus on opposing violence, upholding universal rights, calling for restraint and supporting Egyptian efforts of political reform. Among the meeting's participants were Vice President Joe Biden; National Security Adviser Tom Donilon; John Brennan, assistant to the president for homeland security and counterterrorism; White House Press Secretary Robert Gibbs and senior advisor David Plouffe. 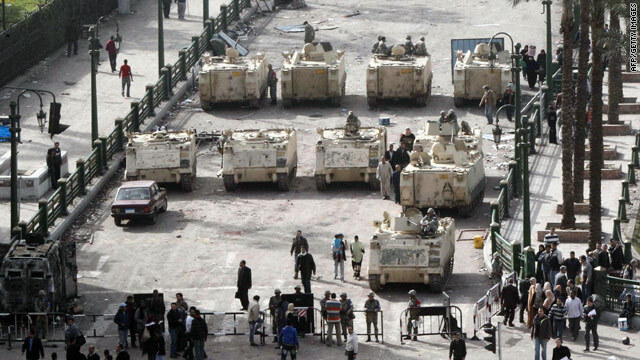 Egyptian Republican Guard tanks are positioned at Cairo's central square. Egyptian military tanks surrounded Cairo's Tahrir Square, where hundreds of protesters had gathered on Saturday.Demonstrators chanted "Down with Mubarak" and "We are all Egyptians." The atmosphere was tense, but people gathered in the square were posing for pictures with tanks and shaking troops' hands. Tahrir Square, located near many government buildings in the heart of downtown Cairo, has been a focal point for protesters. Nearby, police fired tear gas on protesters who were pushing toward the country's Interior Ministry.